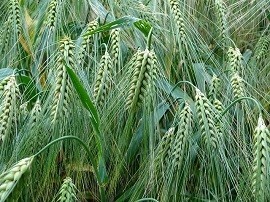 Check out this barley nutrition fact: I just found out that barley is great for fat loss. Especially when eaten early in the day. Here's why: The secret to barley is its fiber content. Due to the high amount of soluable fiber in barley, it creates a very low blood sugar spike compared to other carbs and takes a long time to digest. Large blood sugar spikes lead to increased fat storage through the activity of insulin, a naturally occuring hormone. Barley provides you some protection against this. From what I have been reading, barley eaten at breakfast is still being digested during lunch (44%) and even as late as dinner (14%). That means barley eaten early helps protect you from excessive fat storage during much of the day. Experts say that to keep your blood sugar level, you should eat foods with a GI of less than 55. The glycemic index (GI) of pearl barley is 25, making it a very low glycemic food. Cheerios, by comparison, has a GI of 74. Barley is consistently rated as one of the best whole grains for weight loss and blood-pressure control, as well as protection against type 2 diabetes, cardiovascular disease, and certain cancers. Let's include barley in our morning meals!